Gentle solid Broke white 15.1HH, 1600 pound, 6yrs old Prison mare. 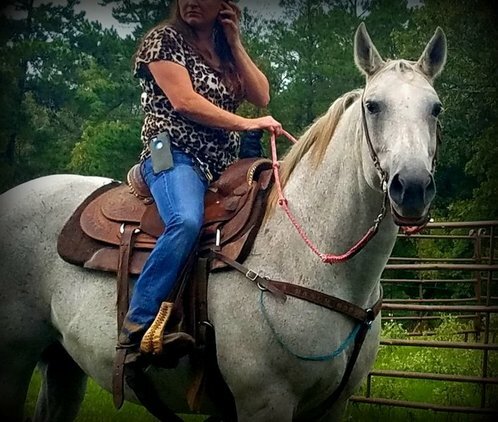 This girl is as bomb proof as you are going to get ( with that being said nothing is 100% bombproof), solid sane one hand broke mare. She has a very good handle and will walk, trot, lope, stop and turn in a open field with just a rein around her neck. She is a real good trail horse that is not spooky and had cattle sorted and penned off her all evening today 10/07/18. We are told you can shoot and reload off her and to date we have not seen her take a lame step. She Is still young enough to give her a job as a ranch or roping horse as she has cow sence and isnt scared of a rope. She would also excel as a queens horse or drill team horse with her good handle and mellow nature. Very sweet horse! Come give this girl a try you will not be disapounted! !